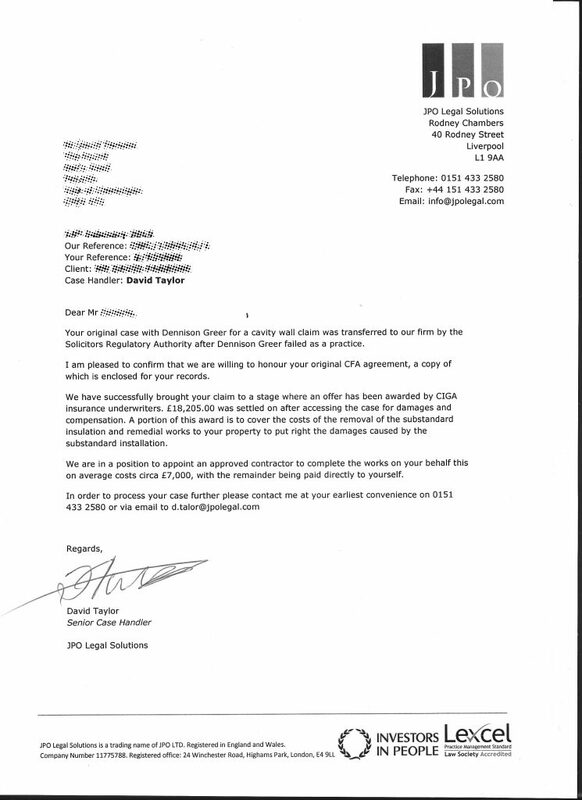 CIGA have recently been made aware of a new scam by a company called JPO Legal Solutions. This company are targeting homeowners to notify them that a claim has been transferred to them in relation to their cavity wall insulation. This is categorically incorrect. CIGA have not and will not agree to settle any case via JPO Legal Solutions. Under guarantee terms CIGA serves to remediate not compensate. 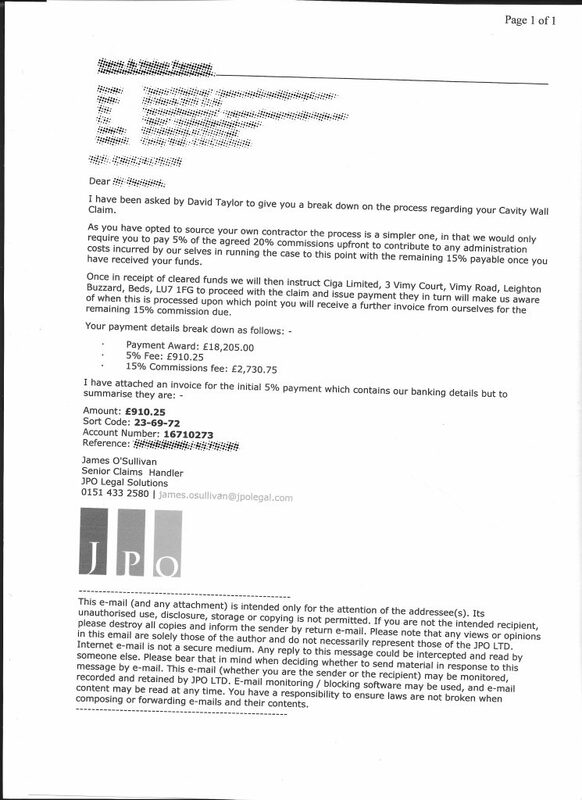 Please be aware that this company is requesting a 5% initial payment of £910.25 from homeowners. If you have a CIGA guarantee and have concerns with your cavity wall insulation please contact concerns@ciga.co.uk and we can investigate where necessary at no cost to you. Find out more about scams and cold callers and claims companies here. 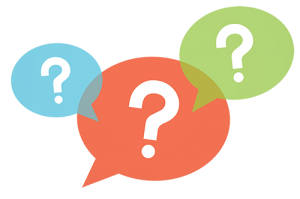 For more general information see our FAQ pages here. CIGA is becoming ever more vigilant in ensuring that we have secure measures in place to protect our guarantee holders and we take identity theft very seriously. Unfortunately, we continue to have a number of approaches from unscrupulous companies claiming to be the homeowner to secure guarantee data. To make sure that we really are speaking to you about your property we ask that you provide proof of ownership when querying any guarantee information. E.g. if there is a guarantee for your property or to report a concern. If you are concerned and feel you have been a victim of identity theft please report your concern to action fraud. Please note CIGA are currently experiencing technical issues meaning we are currently unable to receive emails. We are working to resolve the problem as quickly as possible. Technical issues have now been resolved. Please note emails sent to CIGA on Friday 16th through to Monday 19th (inclusive) will not have been received. Please resend any emails to concerns@ciga.co.uk or info@ciga.co.uk depending on your query. All concerns logged through the website have been received successfully. Following a review of our administrative process, we are implementing a change in our administrative practice for when we receive Subject Access Requests (SARs) from third party organisations, on behalf of householders. Please note, with immediate effect, we will no longer be accepting Forms of Authority (FOAs) and will not provide a response to a requesting organisation. Going forwards, we will now only write to the householder, who may share this information with third parties if they wish. Who is cold calling you? CIGA are receiving reports that householders are being cold called or door knocked by individuals claiming to be representatives of CIGA. CIGA do not cold call householders. If you are called or approached on your doorstep by someone selling services and claiming to be a representative of CIGA contact your local trading standards on 03454 04 05 06 and report the incident to Action Fraud. All CIGA inspections will be prearranged with you through the head office as a result of you contacting us with a concern. All Inspectors will carry a CIGA proof of identity, will introduce themselves and talk you through the inspection process. Homeowners who have any doubt as to the legitimacy of anyone presenting themselves as a CIGA employee should not allow them into their home, prevent them from carrying out any inspection works (which depending on the nature of these works may invalidate the guarantee) and contact the CIGA main telephone number 01525 853300 to confirm the identity of the individual concerned. Please note CIGA will never turn up at your home unannounced and one of our staff will always contact you to make an appointment. For more information on how to protect yourself and your home click here. Please note the office is closed today for essential staff training. If you have a concern with your insulation or an ongoing case please email concerns@ciga.co.uk If you have a general query please email info@ciga.co.uk and we will endeavour to respond to your query within 48-72 hours dependent on the nature of query. In response to recent changes under GDPR and to ensure that our procedures for personal data remain robust CIGA have taken advice and have, with immediate effect, taken the decision to remove any reference to the homeowner from its circa 6 million guarantees. This change will not affect the CIGA guarantee terms which continue to provide protection for your home and any future home owners however it does make clear that the guarantee relates to the home and not an individual owner. We are confident that we are complying with our obligations under the Data Protection Act 1998 and the principles contained in the EU General Data Protection Regulation and as such will not treat searches for a guarantee as Subject Access Requests. Should homeowners require a duplicate copy of a guarantee they can still purchase a duplicate and any such guarantee will be issued to ‘The Occupier’ and not a named individual and will require evidence of proof of ownership of the property. From March 2018 CIGA will implement the next stage of its consumer focused improvements by introducing a new role of CONSUMER FOCUS, this arrangement will replace CIGA’s Consumer Champion taking up individual complaints with CIGA. The Consumer Focus role will be headed up by Mr Brian Yates. Brian is a board member of Which Magazine with an extensive history in Customer Services and is currently the Chair of the CIGA Customer Services Committee and is a non-executive director on CIGA’s council. Do you have a question about your guarantee or CIGA’s services? CIGA now have a dedicated page answering all of your frequently asked questions. I’m not sure if I have a CIGA guarantee what should I do? Do I need to have a copy of my CIGA guarantee to raise a concern? I can’t find the original CIGA guarantee and I want to get a replacement copy, what should I do? For more information on looking after your property after cavity wall insulation has been installed, claims companies, frequently asked questions and more and condensation check out our information and guidance page. CIGA introduced an independent arbitration service in 2016 provided by the Centre for Effective Dispute Resolution (CEDR) who are approved by the Chartered Trading Standards Institute. Over the past year CIGA has been monitoring this service and its benefit to consumers. The arbitration service is proving effective with circa 66% of claims resulting in either a full or partial settlement in favour of the homeowner and whilst this has not always resulted in delivering total satisfaction to the claimant it has played an important role in providing an effective settlement from which both parties can move forward. Many claims do fail because they are outside of the scope of arbitration and should not have been submitted. CIGA has recently worked with CEDR on updates to the rules which will assist in clarifying the scope and ensure claims have a better chance of success should they prove to be a legitimate concern. The scheme was launched when CIGAs customer service was implementing improvements to address justified criticism at that time. CIGA has now taken the opportunity to reflect and benchmark it against similar Arbitration services and review the associated costs of administrating the service. As a result, CIGA has taken the conscious decision to amend the Arbitration fee and provide a balance between supporting legitimate access and controlling claims costs. Whilst the cost of submission will be increasing it is evident that this increase is still very much in line with other arbitration service charges. ADR will now cost the complainant £100 + VAT effective from 01st January 2018 in line with similar schemes. Should the ADR find in favour of the complainant (either partially or fully) then fees will be fully refunded. CIGA will continue to consider full funding for complainants where the ADR route is not easily accessible due to personal circumstances. Recently there have been disturbing reports of individuals door knocking and claiming to be representatives of CIGA. A CIGA inspection will always be prearranged with you through the head office. All Inspectors will carry a CIGA proof of identity, will introduce themselves and talk you through the inspection process. Homeowners who have any doubt as to the legitimacy of anyone presenting themselves as a CIGA employee should not allow them into their home, prevent them from carrying out any inspection works (which depending on the nature of these works may invalidate the guarantee) and contact the CIGA main telephone number 01525 853300 to confirm the identity of the individual concerned. Should it transpire that they are not a CIGA employee but have fraudulently served to represent CIGA then you are strongly advised to inform the local police providing as much detail as possible as this could be an attempt at theft or identify fraud. Please note CIGA will not turn up at your home unannounced and one of our staff will always contact you to make an appointment. For more information on how to protect yourself and your home click here. Due to an increased number of approaches from fraudulent companies claiming to be the homeowner to secure guarantee data, and those using objectionable behaviour purporting to provide claims management services, CIGA has taken the decision to introduce additional security checks to ensure the homeowner’s information is protected. CIGA want to ensure the homeowner is clear as to the support and cover they can expect under the CIGA guarantee which serves to provide redress when there is a problem with an install or materials associated with cavity wall insulation and the installer is no longer trading or able to fulfil their obligations. More specifically CIGA wish to clarify that the guarantee provides for remediation of directly associated damage and not compensation for loss or indirect/incidentals. CIGA wish to clarify that it denounces the practice of giving false expectations to homeowners by misrepresenting the redress available under the terms of the CIGA guarantee. The guarantee exists to service claims in materials and workmanship and for directly attributable costs and is effective when the installer is no longer trading. CIGA will always look to service the guarantee in a fair and transparent manner and will seek legal and/or regulatory body redress against companies or persons serving to fraudulently claim against the guarantee.